Salesforce’s standard Lead Conversion leaves a lot to be desired, unfortunately. 3. Creating a new Lead using an existing Account and an existing Contact associated to that Account. Thankfully, they have provided the means to enhance the functionality without touching a single line of Apex. As a note, this presumes that your org is configured to allow Contacts to be associated with multiple Accounts AND that you’re expecting an Account, Contact, and Opportunity as an output of the conversion process. So, the scenario below works IF you are creating a new Account and associating it with an existing Contact (who has a primary relationship with a different Account). – “ConvertedOpportunityId”, “ConvertedAccountId”, and “ConvertedContactId” are not NULL. This combination of fields validates that the Lead has been corrected converted and has the appropriate association with the downstream objects/records. The flow then takes the record ID of the Lead as its initial input (we created a custom field to store this value just as an internal validation). From that Lead record it returns the IDs in the “ConvertedAccountId” and “ConvertedContactId” fields. These ID values are then used to query the Account Contact Relationship object to determine if a relationship currently exists. If the answer is “No” then we create that relationship (which appears as the secondary relationship for the existing Contact). If the answer is “Yes” then we proceed to the next step. This step makes updates to the Opportunity record (e.g., changing a field value and updating the Oppty name per a specified naming convention). During the conversion process Salesforce ignores the Account specified and substitutes in the Account that’s associated with the Contact. Bug logs, unfortunately, provide no clues as to the cause. Workarounds do exist but…they require additional fields on the Lead which, in turn, rely on user input and would require an update to the Flow to take this additional data into consideration. Hopefully (fingers crossed), Salesforce responds to my case with an update in the near future!! If/when they do I’ll post an update. Salesforce has recently published a news release that is relevant to all users of middleware solutions. To uphold the best practices in Security, Salesforce has decided to rotate some certificates out during January and February 2018. Google Chrome no longer supports Symantec-issued HTTPS certifications and is now going to use DigiCert-issued certificates instead. This could have an impact if you and your company use a middleware solution like Mulesoft, Scribe, IBM Broker, etc. to interact with Salesforce once the certificates are updated by Salesforce. According to Salesforce, “To test your software and middleware solutions, use //certtest.force.com as the base URL of the API login URL. If you see an invalid username error or a different HTTP status code, then the test was successful. For the vast majority of Salesforce users this will have no impact on your day-to-day experience. However, companies with middleware solutions are most likely going to require some configuration updates to trust the new root, intermediate, and other relevant certificates with DigiCert. The deployment schedule for these updates certificates are: 1) Sandbox instances during the second week of January, and 2) Production instances during the second week of February. Additional information can be found at the following site, Salesforce Certificates change from Symantec to Digicert in Jan 2018. These updates should be thoroughly tested and validated in your Sandbox instances prior to the Production deployment. If you would like to see what CleanSlate can do for you and your Salesforce Sales and Service Cloud orgs please contact us today! Is Bimodal IT A Realistic Approach? The topic of bimodal IT has been around for several years and I have a couple clients who are actually considering implementing a bimodal approach to meet the needs of a wide customer base. Upon hearing one particular client talk, with enthusiasm, about implementing bimodal for his team, I wondered if the expectations being set are truly realistic. Mode 1 focuses on predictability and has a goal of stability. Mode 2 is exploratory and is best-suited for areas where an organization cannot make an accurate plan because of too many unknowns. In essence, Mode 1 operations are basically “keeping the lights on” from an IT perspective, while Mode 2 is where innovation work is performed for future design. The bimodal approach outlined by Gartner matches an experience I ran into while working as a full-time employee a few years ago. This scenario was driven by two recently promoted individuals who both reported to the CIO. In an effort to figure out how to allocate staff across these two senior vice-presidents (SVPs), the decision was made that one-half of the development team would be in charge of new application development (Mode 2), while the other half would be in charge of production support for applications that were fully deployed (Mode 1). Perhaps, on a whiteboard or an organization chart, this sounded like a logical breakdown. One SVP handled everything in production, which included the Data Center and associated support staff, plus a development team to handle break/fix needs and minor feature requests. The other SVP would be focused on meeting the emerging needs of the business, agile and exploratory in nature, to provide solutions that were flexible and not confined by legacy decisions. The Mode 2 team would provide innovative solutions and, once ready, they would pass the solution to a Mode 1 team, before starting work on the next innovation. The resulting challenge for this approach is that, more often than not, the solutions designed by the Mode 2 team were not completely thought through from a production support perspective. It was like the team put on blinders and developed a solution that met the business need with a laser-focused approach. While meeting the requested need, the solution often did not fit in well with the larger IT application infrastructure. In some cases, competing frameworks and languages were selected, which had an adverse effort on the Mode 1 team attempting to support the application once it was transferred to their control. In several cases, the Mode 2 design approach was not complete, exposing a backlog of technical debt that had to be corrected as part of the first production support Sprint implemented by the Mode 1 team. Attempts to resolve these design issues were not successful because the Mode 2 innovators always focused on the next innovation and failed to consider how their decisions impacted production support of the application. As one might imagine, this caused discord between the two modes and cultivated an environment that, though once enjoyable to work in, became challenging at best. The core of this issue was the need to split up staff in order to accommodate two individuals who were recently promoted. As a result, changing the model wasn’t a possibility. The better approach would have been to maintain one development group. Instead of fully dedicating the staff to a given mode, rotating the roles periodically would have been a much better approach. Meaning, the team introducing a new innovation would continue to support/maintain the application, while the other team would be assigned the next new project. I have found that if the Mode 2 innovators go into the process knowing they will need to support their solutions, they are more likely to be responsible with the decisions that are made. Pioneers – truly innovators, like Mode 2 teams in Gartner’s Bimodal IT. Settlers – the missing layer – a team dedicated to refining, maturing, and stabilizing products before they are considered production-ready. 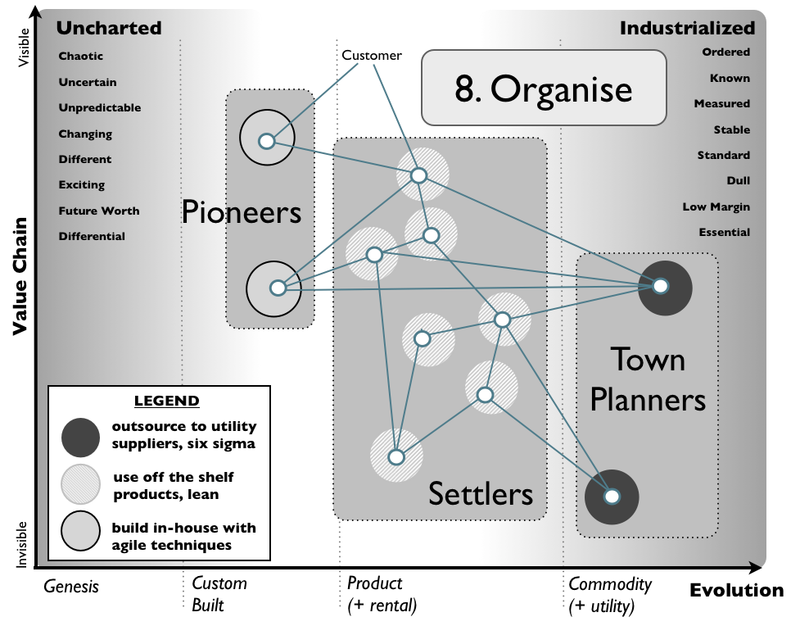 Town Planners – truly production support, like Mode 1 teams in Gartner’s Bimodal IT. Keep in mind, the chart above is simply one step (out of ten) in Simon Wardley’s “How to get to Strategy” publication, which I recommend reading when time allows. In my experience, larger corporations have placed the pioneer need into the hands of enterprise architecture (EA) staff. The EA team maintains the responsibility to innovate, making sure their innovations have the ability to work within existing IT infrastructures. A challenge to this approach is that the burden can be too much to place on the settlers – since they are not always approaching the solution with the same mindset as the pioneer. The pioneer’s vision is one of enterprise scale, while the settler has a focus on meeting the current need of the business. So, even in a trimodal (or VCM) approach, challenges should be expected. I understand there are individuals who thrive as innovators and there are individuals who enjoy their focus on providing production support. However, for a majority of those in Information Technology, there is a desire to participate across both ends of the spectrum. It is important to understand the background, goals, and traits of your staff before trying to place them into positions which are not a solid fit, based on their skills, abilities, and ambitions. Since an IT department’s greatest investment is the human resource expenditure, the decision to implement bimodal, trimodal or nonmodal (I just made that up) should be driven by the people who will actively live in that mode. Making the incorrect decision and hoping for a positive result is no different than trying to place a round peg in a square hole.